It’s always great to see writers getting rewarded for their hard work, especially when they belong to your writers’ circle. This year has been especially fruitful for the BWC’s writers: another proof that Brussels is a city of inspiration. Antoinette Naomi Reddick published her book, “Waiting for Oz, Follow the Lessons Along the Road”. Colin Walsh won the Francis MacManus Short Story Competition with his “The Flare Carves Itself Through The Dark”. His short story “The best thing” was highly commended by the Bridgeport prize and was published in the latest anthology. J. L. Morin’s “Nature’s Confession – Climate Change” is among the Book Excellence Award finalists and was listed a top 10 Best Science fiction book. “Nature’s Confession” was also chosen as The Best Climate & Environmental Fiction Book and got an honourable mention on Reader’s Favorite. Lida Papasokrat published her story “St Roman the Melodist” in Offshoots 14: Writing from Geneva. T. D. Arkenberg’s short story “Marguerite and the Grand Sablon” is a semi-finalist and “Parvis de Saint-Gilles” is among the finalists in the Faulkner-Wisdom Literary Competition. Martin Jones’s “What women want” got a third prize in Story Comp and is now published in the Writer’s forum. Patrick ten Brink’s short story “The take” got an honourable mention in Glimmer Train’s short story award for new writers. His short story “Amelia Borgiotti” is long-listed in the Hourglass short story competition. Some of our more modest writers, Kevin Dwyer, Claire Davenport, Joachim Schloemer and Hamed Mobasser aka Punchdog Productions, received awards for their film scripts. The BWC is thrilled to announce that member Nick Foster’s True Crime book ‘The Jolly Roger Social Club’ is being published by Henry Holt next month. Huge BWC congratulations are therefore in order! Nick Foster, who hails from Liverpool in the UK, has been a member of the Brussels Writers’ Circle since 2000 – when the ‘Circle’ was a ‘Group’, Belgians spent francs in the shops, and we were all a lot younger. The commitments of family life mean that Nick doesn’t attend meetings as much as he would like; the rest of the time he cheers on the efforts of the group from a distance. In 2014 Nick got a deal with Henry Holt in New York to write a non-fiction book on the story of an American serial killer who murdered five of his compatriots in Bocas del Toro, Panama – an outwardly idyllic stretch of Caribbean coast, with azure seas and white-sand beaches. Nick’s book, The Jolly Roger Social Club, will be published in July 2016 by Henry Holt in North America, and by Duckworth Overlook in the UK and other English-speaking territories. So Nick, tell us about your book? I was living in Latin America back in 2011 and I came across the story by chance. A young American man named William “Wild Bill” Holbert had, apparently, killed at least five of his compatriots in a vaguely sinister expat community located in a remote part of Panama. Holbert ran a bar called the Jolly Roger Social Club with a flyer promising that “over 90% of our members survive”. That itself seemed ominous. Then I wondered about the expats: Why were these people there at all? What were their motivations? And how did it affect things that this was an American crime transplanted, if you will, to Latin America? What kind of culture clash might this entail? My questions went on and on. That’s when I figured that this was the story I was looking for. There’s a longer description here: http://us.macmillan.com/thejollyrogersocialclub/nickfoster. How did you get a book deal for The Jolly Roger Social Club? Through the traditional route of getting a literary agent (in London, in my case) and then a publisher. I took a month off work to visit Panama and to write the book proposal. For me, it was important to set a deadline to get the proposal ready and sent off. From then it took about four months to get a book deal. The North American rights to The Jolly Roger Social Club were put up for auction by my agent and he set a date and time for bids to come in from the States. Ten minutes before the deadline there were still no bids. I was getting despondent. Then two bids suddenly came in, including Holt’s. I could hardly believe it – it was a really happy moment. After that, the hard work really started. Everything had to be researched – non-fiction means precisely that: it’s all true. I went to Panama a further four times and once to the United States. They were all long trips. As I wrote the story, I discovered it had the most amazing twists and turns. You really couldn’t have made this one up. You read your book out at BWC meetings along the way. How did the feedback you received help with writing the book? It was very useful. Even though most members write and read fiction, rather than true stories, I got really good feedback. I could instantly see which passages worked and which ones didn’t. Any tips for aspiring non-fiction writers? First of all, read a lot. In my case, before I even got on the plane to Panama I devoured a vast amount of narrative non-fiction to see how it was done, to try to break it down. That alone took six months. I needed to see how other writers structured their books. It’s a really important point: if my book just follows me, the writer, discovering a story by interviewing people and uncovering facts, it won’t be very compelling – it will simply be an account of me becoming gradually less ignorant about something. To make a story riveting, you need look how good writers approach chronology, how they use flashbacks, how they establish a powerful sense of place, how they arrange their narrative around strong scenes. You also need to get the pace right and your story has to be suspenseful. When you pitch your book to an agent, you have to be absolutely focused. Most agents explain on their website precisely how they want to receive pitches. Follow their instructions to the letter. Do exactly what they ask you to do. Try and put yourself in their position: the publishing industry is a business and, if they take you on, they will pitch on your behalf to publishers. So don’t complicate things for them – be clear precisely what your book idea is about, and tell them clearly and concisely. Check this page out for some more tips: http://ducknet.co.uk/blog/ten-tips-writing-creative-nonfiction. It helped me when I started writing my book to think of it in terms of building blocks. You have a certain number of chapters and then sections in each chapter. It’s easier to think of a book as forty sections of 2,500 words than a big job of 100,000 words you have to sit down and write. On the non-fiction side, the direct influence for The Jolly Roger Social Club was A Death in Brazil, by Peter Robb. Apart from Robb, Sebastian Junger and Jon Krakauer are both excellent. The late Gordon Burn was a terrific writer, and a northerner to boot. The Art of Political Murder by Francisco Goldman is beautiful and heartfelt. Robert Kolker’s Lost Girls: An Unsolved American Mystery is the best true crime book I have read in a while, and Laura Hillenbrand’s Unbroken – the survival story to end all survival stories – has a wonderful cinematic quality. In fiction, and off the top of my head: James Salter, Graham Greene, Richard Ford, Kazuo Ishiguro, James Joyce, Philip Roth, JM Coetzee, Peter Carey, David Szalay, William Boyd, Geoff Dyer and Tobias Wolff (I’m not a big fan of memoirs but Wolff’s are superb). Finally, I don’t read very much poetry – at least not compared to prose – but I simply cannot get enough of Philip Larkin. Thanks Nick, and congratulations again! “One does not discover new lands without consenting to lose sight of the shore for a very long time.” Andre Gide. That quote, one of my favorites, speaks to the necessity of risk—courage to leave behind the safety of the familiar—in order to grow. As authors, we soar highest I think when we push ourselves away from the familiar. Readers crave fresh perspectives, unique storylines, and unfamiliar settings. Experimentation is a great teacher. But as rewarding as discovery may be in our writing, losing sight of the shore in our personal lives can unsettle. As I prepared to leave the USA two years ago, apprehension tempered the excitement. What would life be like in Brussels? What about my writing? A new continent and city would certainly provide fresh material. But writing is lonely, an occupation often pursued in silent refuge. In Chicago, I found a cure for isolation. I joined, Off Campus Writers Workshop and The Barrington Writers Workshop, the city’s two oldest writing groups. The bonds formed with fellow writers fulfilled me, personally and professionally. Camaraderie was only one benefit. Members inspired and motivated, helping me to become a better writer. Surfing the Internet from the security of my Chicago home, I found the Brussels Writers Circle. The website was informative and welcoming. With a very favorable first impression, I dashed off an email of introduction. Upon receipt of David’s reply, I felt comforted. A safe haven awaited me on that distant, unknown shore. Within a fortnight of my arrival, during the dark, drizzly evenings of early January, I made my way to La Maison des Crêpes on Tuesdays and Le Falstaff on Thursdays. The first tour de table of introductions allayed fears that I was alone. All of the writers had made their way to Brussels from some other shore, near and far. Many had even crossed another frontier, language. BWC members for whom English is not their native tongue amazed me. Weeks turned into months. BWC didn’t disappoint. Among the writers, I found the same dedication, resourcefulness, imagination and support that endeared me to the colleagues left behind in Chicago. Similar passions, I guess, drive those who yearn to write. We have a need to tell stories, stir emotions, and share truths. And maybe even more important than providing a place to hone my craft, the writers of BWC offered friendship to Jim and me. That social outlet allowed us to adapt much quicker to our Expat life. Once settled, I could focus on writing. And, I’ve been very productive. While living in Brussels, I self-published two novels, Jell-O and Jackie O and None Shall Sleep, and nearly completed the initial draft of my next project, a memoir. Throughout this time, BWC members offered encouragement. Perhaps that explains why so many BWC writers are published authors. Sessions provide a safe forum. I felt comfortable experimenting with non-fiction and poetry. Honest critique based on trust and respect explains BWC’s success. The opportunity to co-chair Tuesday night sessions pleased and honored me. Jim and I both hoped that we could have stayed in Brussels longer, but a life open to adventure knows few certainties. A new job for Jim within the Nielsen Company takes us back to Chicago. As for me, I plan to take a playwriting course to turn two ideas into dramas. Things are starting to disappear from our home as our departure date nears. A barbecue grill, vacuum cleaner, blender, even Jim’s car. Of course this is merely stuff. We’ll miss many things about Brussels. But most of all, we’ll miss the people, especially, our many good friends of the Brussels Writers Circle. As Jim and I prepare to leave Brussels, we face resettlement with a mix of apprehension and excitement. Yes, we have come full circle. But we return richer people because of our experience. And, I’m a better writer because of the Brussels Writers Circle. Thank you, BWC. 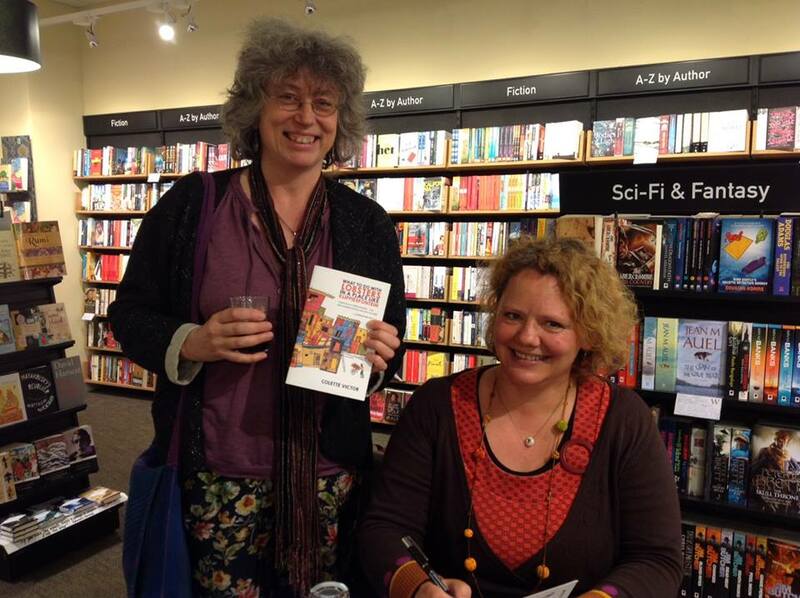 Two thousand and six congratulations to BWC member Colette Victor, who has recently published her second book! Her novel What to Do with Lobsters in a Place Like Klippiesfontein was released by Cargo Publishing earlier this month. We interviewed Colette back in November 2013 about the publication of her first book, Head Over Heart, so we thought it only fitting to sit her down again to talk about her latest success. Here she talks about her novel which may never have become a novel at all if it wasn’t for the prompting of the keen members of the BWC. 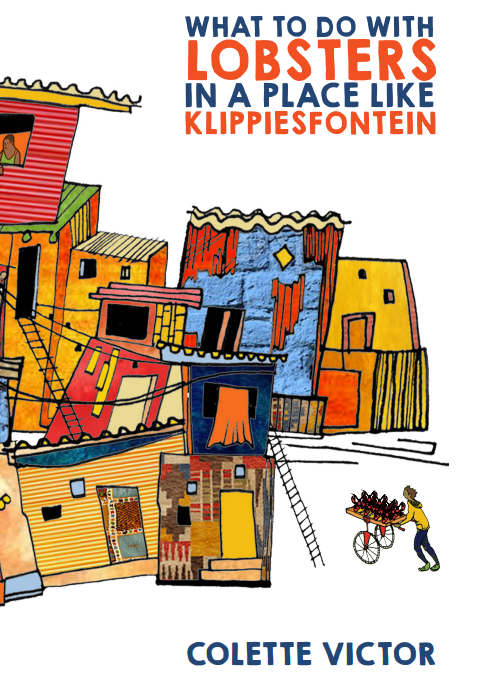 Congratulations on the publication of your second book, What to Do with Lobsters in a Place Like Klippiesfontein! Could you tell us, briefly, what the book is about? Oom Marius, storeowner in a conservative, rural town, has long harboured a crush on Patty, but fails to impress her when he installs a lobster tank in his shop. Tannie Hettie, Oom Marius’ wife, must have cancer treatment in Cape Town, creating a predicament for Oom Marius. Petrus, Oom Marius’ mute helper for twenty-two years suddenly speaks! He volunteers to run the shop asking if bookkeeping-skilled Precious, a young township woman he secretly loves, can work with him. Oom Marius agrees. In church, the dominie (pastor) informs the congregation that a black man will manage the shop while Oom Marius is gone. Many white inhabitants do not want black people taking traditionally held white positions. A group of white men barricade Oom Marius’ shop front, while Charlie, one of Oom Marius’ supporters, helps Petrus and Precious. An attraction develops between Precious and Charlie: Petrus helplessly watches. In South Africa there are towns where the dominance of whites and contempt for blacks still exists despite twenty-one years of democracy. This bittersweet comedy raises aspects of the dilemma. A gentle story, set at the beginning of summer, always hot and dry, revolves around the shop and a lobster tank. Will the lobsters survive? Will Charlie and Precious’ feelings come to fruition? Will Tannie Hettie survive cancer? How do Patty and Oom Marius relate when Shawn leaves? It started off as a short story probably about four or five years ago. The novel itself took me more or less two and a half years to write, including the various edits and redrafting. Did you read out draft versions of your novel at BWC meetings? If so, do you have any memorable moments you’d like to share from this experience? I remember reading out the short story in someone’s flat at the height of summer, I think it was Kathleen’s place. Several people commented that it was too short, that the characters were too interesting to abandon to such a short piece of fiction. It was on my way home in the train that I decided to develop it into a full-length novel. I read many chapters out at the meetings and always took the advice or comments I was given to heart. There was no point being defensive about my work and defending each and every sentence because that way I’d be stuck with a well-defended piece of writing and nothing more. If I wanted to grow then I had to listen to what people were saying. If a single person made a comment on some or other obscure phrase I would ignore it, but if several people commented on the same thing I knew I was doing something wrong. Eventually I started anticipating the comments while I was writing and I think it was at that point that my writing started improving. This is your second experience with publication, following Head Over Heart. Was it just as exciting, second time around, learning that the book would be published? How did you feel when you found out? The news of publication for both books followed each other pretty quickly. First I went through years and years of rejection emails from agents and publishers and then suddenly both books did well in two separate competitions – The Mslexia Children’s Novel Competition 2012 and the Dundee International Book Prize 2013. On the back of this success I found an agent and then two publishing contracts followed within a couple of months of each other. And yes, it’s definitely just as exciting getting this one published. What to do with Lobsters in a Place Like Klippiesfontein is probably a little closer to my heart than Head Over Heart. Cargo Publishing is a small publishing house with a lot of attention for its authors. So saying I’m thrilled would be a sad understatement. There probably isn’t a word big enough to describe what this feels like since it’s something I’ve hankered after since I was nine. Do you have any other books/novels in the works right now? If so, can you tell us about them? I’m working on a book called The Godforsaken. It’s set in a run-down bar in the middle of Brussels and is frequented by a bunch of characters who live on the seedier side of life. It takes a look at poverty in Belgium, in Europe, and society’s prevalent pastime of blaming poor people for their situation while sitting happy and insulated on a cushion of middle-class contentment. Hopefully it should be finished to send off to my agent by the summer. Last but not least, what a title! Did you have any other possible titles in the offing, or was this one always it? The book started off as an entry for a short story competition under the title of ‘In the Deep’, but it changed pretty quickly after that, to What to do with Lobsters in a Place Like Klippiesfontein when I decided to develop it further. I played around with ideas and word combinations until I found something I was happy with.